Shortage of boxcars is holding up shipment of wheat from Coulee City, Guy Stafford, manager of the Centennial elevator, reported last week. A large amount of wheat may be carried over into the next harvest season, he said. Centennial loaded 11 cars in November, six in December and 12 so far in January, and now has about 250,000 bushels of wheat on hand. Mr. Stafford estimated that there is about 100,000 bushels of wheat stored on farms in addition to that in elevators here. Presented by Michael Sol via the MILW list at Yahoogroups. Below is the official "construction record" of the Marcellus branch of the Chicago Milwaukee & St. Paul Railway, generated in 1915. The H.C. Henry Company, a ubiquitous railroad contractor in the PNW, got the contract. preliminary and four miles of location for each mile of adopted line. Seattle. The line was divided into four residencies of various lengths. tangents intercepted by east curvature. work was largely done by teams with wheeled scrapers and fresnos. greasewood which required clearing for light grading. In general, the grading was light. Much of it was side borrow work. hard to hold under such conditions. from where it was hauled by team to the points of erection. Culverts were built of vitrified pipe, hauled by team from Warden. rainfall and cloud-bursts, which require unusual drainage facilities. construction have been washed out and replaced by pile bridges. . Warden was the point of supply for track laying. A Roberts Bros.
machine was used and new 65 pound rail was laid. drilled wells have since been installed at Ruff and Marce1lus. Tiflis, Ruff and Marcellus, and depots at the two last named places. as well as in the depots. When the Waterville Railroad died the other day with dramatic and prosaic suddenness, it meant the passing of a pioneer landmark of North Central Washington that while small, was an important phase in the economic development of the area. The death announcement was brief and commonplace. Just a blunt statement by the Interstate Commerce Commission announcing that the Waterville Railway Company was authorized to abandon its six miles of roadbed between Waterville and Douglas. The road was once the shortest in the nation, yet at the time it was built it was a vital link in the transportation of North Central Washington, for it provided an outlet for millions of bushels of wheat from the Waterville area to the Great Northern branch line at Douglas. Then slowly and gradually the road became a victim to progress and the Motor Age. As better roads were developed and better trucks made, the wheat began to trickle to shipping point by truck instead of railroad. Finally in 1948, the little line received a blow that proved to be its death knell. Torrents of flood water swept through the wheat country and took with it the bridges and part of the track. The wheat farmers are a resourceful and enterprising group, and no doubt they would have rallied and rebuilt the line if it had been necessary. But it was no longer a necessary link in the economic set up, so it was allowed to languish and finally die. Built with private capital raised locally for the most part, the Waterville Railroad is a shining example of American initiative and community cooperation at its best. When the Great Northern could not, or would not build a spur into Waterville, the people of the area simply said in effect—“We will,” and they did. That spirit of community resourcefulness in the true tradition of America. It is the same spirit that led the pioneers to rally together after a disaster, rebuild a neighbor’s home or barn or pull his wagon out of a mudhole. No wonder the people of Waterville were proud of their little railroad, with its six miles of track, half dozen employees and limited equipment. Its little engine may not have made as much noise as its big brothers on the Great Northern line, but nevertheless it chugged along, it delivered the goods, and it tootled its whistle just as proudly as any of them. The line was important far beyond its size, and it brusque death announcement will be received with sadness by many a local resident. Another landmark of North Central Washington’s pioneer days has passed into history. This is the first part of a piece being written for the Centennial of Grant County, WA on Feb. 24, 2009. Every line that was built (and a few that were not) will be featured. The area we now know as Grant County was originally part of Spokane County. This area then became part of Lincoln County when it was split off of Spokane on Nov. 24, 1883. Our time with Lincoln County was short, only 4 days, as Douglas County was split from Lincoln on Nov. 28, 1883. Grant County was split off from Douglas on Feb. 24, 1909. Much of what was Grant County was owned by the Northern Pacific (NP), dating back to its completion in 1883 and the land granted to it by the Federal Government. This land was granted to help finance construction; it covered 50 miles on each side of the centerline of the tracks. It was laid in a checkerboard pattern with the Federal Government owning the alternating pieces. This was intended to guarantee that railroad access would increase the value of that part of the checkerboard not granted to the railroad. During the period from Nov. 1883 to Feb. 1909, most of what became Grant County’s rail system was developed. This meant those companies laying the rails did most of their business with Douglas County officers. The first rails laid in what became Grant County were laid by the Central Washington Railroad (CW) in 1889, as it was completing its line from Cheney to Coulee City. The CW was a subsidiary of the NP which was forbidden to directly build branches on its mainline due to a clause in its charter. The CW was organized as a response to the construction efforts of the Seattle, Lake Shore & Eastern (SLS&E) on the east side of the state. The SLS&E was organized as a way to prod the Northern Pacific to build a line into Seattle from Tacoma. The SLS&E goal was a cross-state line that would hopefully connect up with another transcontinental line then building through the Dakotas. The CW started grading in 1888; nearly the same time the SLS&E started its line from Spokane west towards Seattle. The CW managed to get its crews out to key areas of the Grand Coulee to ward off the SLS&E, with the idea of laying rail sometime later. In this they succeeded, but the SLS&E also had money woes, and barely got rail laid to Davenport. Rail was laid in what is now Grant County in 1889-1890, as the CW, after pausing at Almira, continued the 21 miles to Coulee City. Control of the CW was lost by the NP in 1895 when the NP went bankrupt, followed by the CW. In 1898, after the NP had come out of bankruptcy, it organized the Washington Central Railway (WC), to purchase all the assets of the CW, which was completed June 1 of that year. The WC was officially absorbed by the NP on June 29, 1914. A good part of the CW was not built along what the surveyors had laid out. There was a lot of land speculation going on, and the construction crew was corrupt. In many places, the finished line did not follow the survey, and in one instance, the finished line changed even after a right of way had been developed. The CW planned to go beyond Coulee City, to tap the mining area in the Okanogan area. To this end, there was another 5 miles of grading completed west of town, though no rail was laid. Another plan had it extending through the lower Grand Coulee and beyond to connect up to the mainline near Ellensburg. The only extension to the line was the Adrian Cut-off, built between 1902 and 1903. This was done to help combine the properties of the Northern Pacific and the Great Northern, which were mindful of merging back then. It opened for service September 11, 1903. Coulee City boasted the largest servicing facilities on the CW. It had a two-stall roundhouse with tracks 67 feet long, turntable, coaling dock, ash pit, water tower, ice house, and stockyards. The only other place having comparable facilities was at Adrian, which also had a turntable and a water tower. An interesting train wreck occurred at Coulee City in 1909. The Great Northern’s crack passenger train, the “Oriental Limited,” crashed near Coulee City in 1909. A washout on the Great Northern at Wilson Creek caused the train to be rerouted over the CW at Cheney, and to be rerouted back to the GN at Adrian. When the train passed through Odair, someone forgot to throw the switch and the train went over the end of the track west of town. Not much changed on the CW until the building of Grand Coulee Dam. In 1933, NP surveyors laid out a line from Odair to what is now Grand Coulee. This line opened on July 19, 1935. More on this line will be presented later. In February 1944, the 50-year-old Hartline depot was torn down. The night of July 29, 1947, the roundhouse in Coulee City burned down in a spectacular fire. It was no longer used by the railroad, having been leased to a business which sharpened tools for use during construction of Grand Coulee Dam. On March 6, 1954, passenger service on the line was discontinued. The last train made its final run with about 30 passengers aboard. The train had been carrying mail, passengers, and express from Spokane since 1890. The mail service was transferred to an NP truck. The same truck picked up cream shipments and express packages. Mail service had once extended all the way to Adrian, but was discontinued to that point in 1925. 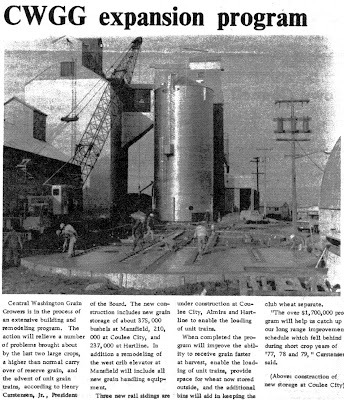 In May, 1966, the NP started a remodel of the Coulee City depot, anticipating business to be generated by construction of the third powerhouse at Grand Coulee Dam. As part of the process, the second story of the depot was removed and the main floor modernized. The NP was merged into the Burlington Northern (BN) on March 2, 1970. Operations on the CW were unchanged. Longtime depot agent at Coulee City, C.W. ‘Skip’ Connor, retired on June 1, 1977 after 40 years with the railroad. The BN did not replace Skip in Coulee City and closed the depot the next day. The BN decided that the relatively unused section of the CW from Odair to Adrian would be pulled up. This section had very spotty service, even back in NP days. The rail was pulled up in 1978. Much of the right of way is still owned by the railroad to this day. 14, 1979, the closed depot was given to the Coulee City Women's Club after they became aware of BN’s plan to scrap the building. They asked for permission for it to be used as a senior or community center. The BN stipulated that the depot be moved from the tracks as part of the donation process. The Women’s Club in turn gave it to the senior citizens of Coulee City. The depot was moved to a plot of donated land near its original location. 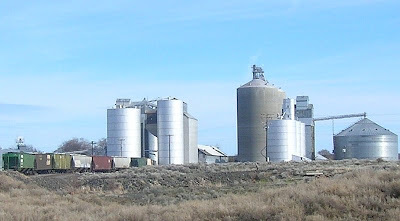 The future of the CW branch was ensured when the Central Washington Grain Growers significantly increased their grain storage capacity at Hartline and Coulee City in 1981. 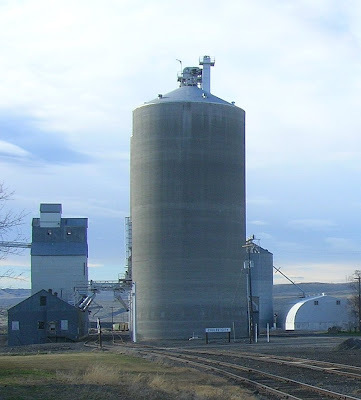 Unit train loaders were built at both locations, and two huge silos were erected on the former depot location at Coulee City. BN was renamed the Burlington Northern Santa Fe Railway (BNSF) in February 1995. By this time, most business on the CW was grain shipment, on an as-needed basis versus a regularly-scheduled train as before. BNSF had been looking to shed many underperforming branch lines over the United States. It set its sights on the CW, and, in September of 1996, sold the line to Watco, which operated the line as the Palouse River and Coulee City Railway (PCC), along with other former branch lines in its possession. The PCC ran as needed until Watco felt the PCC was not earning enough of a profit to continue operating the line. Maintenance on the tracks had been stopped, so what had once been a 40-mph railroad was reduced to 10 mph. The PCC was embargoed in January of 2006, in order to force the Washington State DOT to purchase the line. Watco threatened to pull up all the rails. The WADOT purchased the line in February of 2007, and set about fixing the worst part of the tracks. Operation of the line was turned over to a new railroad, the Eastern Washington Gateway, which started operation soon after the line was purchase by the state. To most people interested in the continued operation of this line, it is still referred to as the CW, even though the actual Central Washington railroad disappeared over 110 years ago. From the Coulee City "News-Standard"
Construction of this new structure obliterated any old signs of where the Coulee City depot had once stood. Even after the depot had moved, I remember seeing the track inspector arrive in town on his speeder and muscle it off the tracks where the old depot had been, as there was still a little place to park the speeder. The improvements at Coulee City were to also help take some of the burden off the railroad line to Mansfield, as that would not have any rail service within a few years. CWGG built the unit train loader as they were mindful of trucking grain here from some of the places on the Mansfield branch.